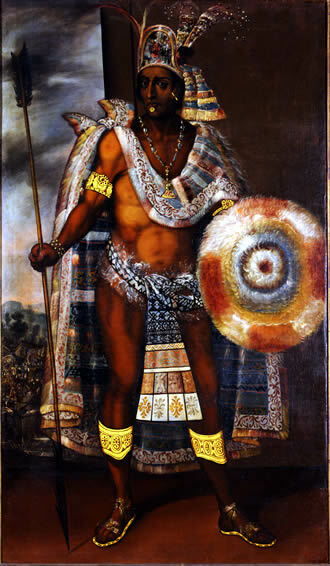 Portrait of Moctezuma by Antonio Rodriguez. History is a kind of official memory, and it is arbitrary what a culture decides to honour and privilege. A Euro-centred version of art history puts an idea we like to call “the Renaissance” beginning somewhere around 1456 with the printing of the three-volume bible by Johannes Gutenberg of Mainz and sees it ending with the death in old age of Leonardo da Vinci in 1519 and the early death of Raphael of Urbino in 1520. In the nature of things, of course, some art historians would have it begin earlier and end later. One is reminded of Woody Allen in an early film, dressed up as a mediaeval man, exhorting his friends “to hurry up or before you know it the Renaissance will be here and we’ll all be painting”. But this is not the art that Hernan Cortes, a young, opportunistic government employee from Salamanca in Spain, found awaiting him in Anahuac, “the land between the waters” when he landed on the Yucatan peninsula via Haiti from Old Spain in 1519. Proceeding westwards towards the heart of the empire, accompanied by a large army of God-fearing Catholic soldiers, the conquerors or conquistadores, abhorred the pagan rituals of the people they encountered, were disgusted by the crude architecture and art forms of the people whilst being all too delighted by their gold. Leaving behind the grand palaces, churches and art of the Old World, with all the immense subtlety and sophistication of the European Renaissance, they crossed a peninsula where what they observed was “barbarous” and “crude” to their eyes. As for their minds, one can only assume that the indubitable cruelty and ruthlessness towards the indigenous peoples was un-informed by irony. 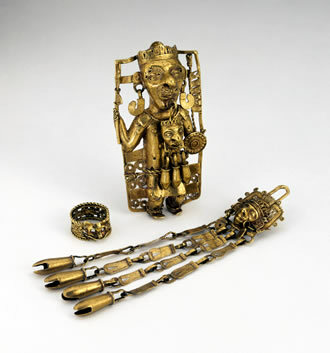 face and warrior-ruler figurine with ritual regalia. Observance of ritual involving human sacrifice was contemptible to the Spanish and unworthy of their greater European sensibility. This accepted that an Inquisition under Pope Sixtus IV in 1478 was warranted, but was disgusted by the equally-bloody practices of the Mexica and the Olmecs, Toltecs, Aztecs and Mayans. That human sacrifice was seen by the Mexica as a way to restore cosmic order was ignored and obviously misunderstood by a people who were steeped in the same story under another name. One of the reasons – incomprehensible and tragic as it now seems – that the Aztec leader Moctezuma virtually embraced Cortes with open arms is that he seemed to embody a long awaited Messiah, known as the Plumed Serpent or Quetzalcoatl. Tenochtitlan, the capital, had been founded in the numinous place where a serpent had been seen perched upon a cactus – still the national image of Mexico. When Cortes entered the city from the coastlands of Veracruz, the indigenous people and their leader Moctezuma had been awaiting the arrival of the plumed serpent or his avatar for centuries. Quetzalcoatl was revered above all other gods in a richly pantheistic culture. He was the spirit god, the morning star. He was Venus. He was a quetzal bird. He was a luminous intellect. He could assume the guise of a bearded, pale-skinned man. Tragically, it seems that the arrival of Cortes and his men was a tragic case of misperception and “Cem Anahuac Yoyotli”, (the Heart of the One World) was in crisis. A comet with three heads was hanging over the land. The temple of the Aztec war god Huitzilipochtli had recently burned to the ground in Tenochtitlan. Most importantly, the defining legend decreed that in the solar year of Ce Acatl, the solar calendar heralded the return of the lost god-king from the East. The heart was cracking in two and could only be saved by a messianic lost saviour, who like Christ, would rescue broken souls. Moctecozoma Xocoyotzin, the 9th Huey Tlatoani (he who speaks with authority) known to us until recently as Montezuma, or as the British Museum have called him Moctezuma II, embraced Cortes as this presence and thus a great culture came to its end in flames and rivers of blood. 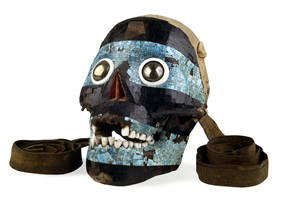 The focus of this show uses this moment as a way of bringing the great work of Tenochtitlan, lodged mainly in what is, to my mind, one of the greatest museums in the world – the National Museum of Anthropology in Mexico City – to the British Museum. For this we must be eternally grateful. In its long series about charismatic and powerful leaders, we have thrilled to The First Emperor, Hadrian, Nebuchadnezzar, Shah Abbas and now the last elected ruler of the Aztecs. This exhibition has brought over treasures from the New World, and displayed in the beating heart of European culture in the Old World they hold their own superbly.